Effortless powder skiing is the goal of Rossignol's unusually-shaped S7 Freeride, a ski that departs radically from traditional design standards, camber and sidecut included. 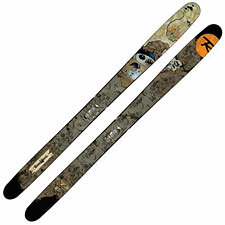 We've entered, in a way, a golden era of ski design. Technological and manufacturing advances are allowing makers to conceive, execute, and deliver skis that previously would never have been possible. The result is a wide-open field of new skis like the S7, unencumbered by the limitations of past years, bounded instead only by the imagination and audacity of their designers. Let's look at some of the many ways in which the S7 is different from your dad's planks. For starters, the S7 employs both traditional and reverse camber. You'll find traditional camber underfoot, while both tip and tail are rockered. Rossignol calls this "AmpTek" technology. My brother calls it the "bent french fry" look. However you describe it, the goal is to use traditional camber for predictable edging on harder snow, while adding the magic of rocker to enhance your deep snow pleasures. But wait: you also get reverse-sidecut with the S7, leading to a vaguely sperm-shaped outline, with extra surface area in the tip, tapering back to a notably narrower tail. As you might imagine, all this ski-geometry rule breaking opens up quite a lot of new turn shape and technique possibilities. You might think of the S7's tip and tail as purpose-specific tools, which you will learn to use depending on what you want and/or need to do. Get on that tip for extra flotation, to rise up above the deepest of snow. Get back on that narrow, rockered tail whenever you need to dump speed or squeeze out a tight turn. What is undeniable about the S7 is that it makes skiing powder much, much easier. The S7 dominated deep snow rental racks this year, proving to be the powder plank of the masses. Though it was not conceived as such, it is a perfect ski for intermediate-level skiers looking to understand what all the fuss is about on those deep powder mornings. The S7's combination of ease-of-turning and flotation will allow skiers of nearly all abilities to get out there and gleefully track up the fluff. Experienced powder skiers, however, may not be as smitten with the S7. For my body weight (145lbs), I found the 178cm S7 a tad too floaty. I like to slow down by sinking the tip (hopelessly old school, I know), and in that regard I was thwarted by the S7's broad, floaty tip. I also like making a more upright turn in powder, and as my day on the S7 wore on, I grew tired of constantly surfing/smearing my way around the mountain. The S7 has its own ideas as to how powder is to be skied, and if you don't agree...tough. Again for my weight, the S7 became a liability as the mountain got tracked out and the snow got chopped up. Those big, floaty tips aren't so good for punching through chop. Away from powder, the S7 quickly becomes a big compromise. On harder snow, you'll find it adequate at best. On the steeps absent powder, the AmpTek hybrid camber didn't inspire much confidence. On the whole, I liked the S7 best when I was skiing untracked powder. I liked it a lot less on everything else. I rate it highly as a powder ski for newcomers—it will absolutely get you out there and get you having fun. Probably more progressive experts will love the S7's smeary turn shapes; probably more traditional powder experts will wish for a more versatile plank. However you see it, the S7 is a bold new step in ski design. I highly encourage you to give it a try.